Marc is one of the piano teachers we worked closely with, and we have previously interviewed him to learn more about his music experiences as a teacher as well as a concert pianist. If you’ve read his interview with us, you’d have learned that he’s a seasoned concert pianist, having performed in various concerts and even organised 2 full solo piano concerts on his own. And this year, let me present to you his 3rd full solo piano concert… Fiery Fantasy III: Reflections. Fiery Fantasy III : Reflections is the third instalment of the solo piano concert series, following Fiery Fantasy (2009), and Fiery Fantasy II : Der Sturm (2011). 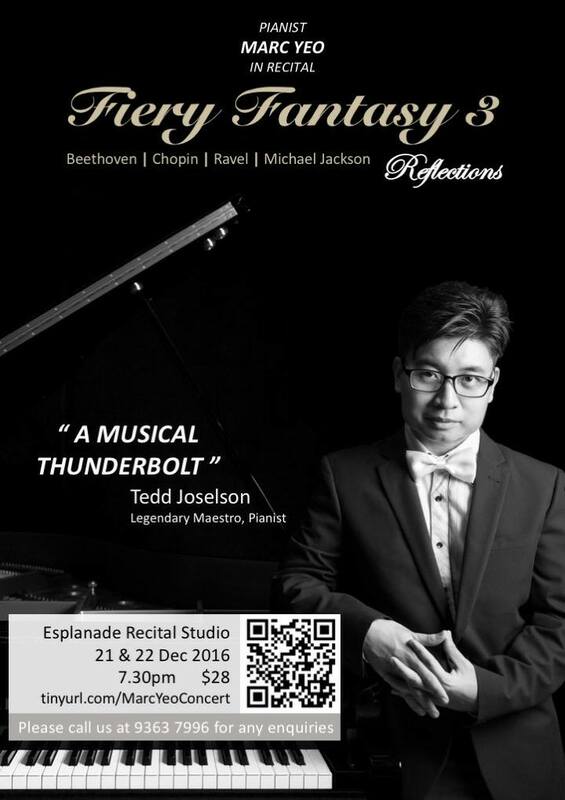 Two nights of enthralling piano music featuring works from Beethoven, Chopin, Ravel, Michael Jackson and Justin Timberlake. To help you understand more about Marc’s concert, once again, we did a quick interview with Marc to give us a glimpse of what we can expect from his piano concert this December. 1. Can you share with us how is the upcoming Fiery Fantasy III different from your previous two solo concerts? The biggest difference is pushing my creative boundaries for this concert. The performance arena has matured over the years, with musicians and musical groups trying out new ways to engage audience. I am utilising visual projections to convey an imagery about the piece that I play. Instead of expressing my emotions in piano playing in the usual play-emcee-play-emcee format, I seek to use images as a visual stimulus to share how and why my chosen repertoire has impacted me at certain points of my life. I am also experimenting with multi-tracking. That means I will be performing alongside recordings of myself on various other instruments. I’d like to see it as I am ‘cloning’ myself for a number of pieces, so my audience will ‘get the most out of me’! 2. We see that the you will perform pieces by Beethoven, Chopin, and Michael Jackson! What inspires you to come up with this repertoire? People come from all walks of life, which also means their level of musical experiences and tastes are very varied. I like to see my repertoire as a well-made meal. For example, soup tastes best when its individual ingredients are well balanced. 3. How long does it take you to plan and prepare for such a concert of this scale? It depends on which aspect of the concert is being discussed. We would like to thank Marc for sharing with us about his upcoming concert!